Newcastle 102 is unloaded at Crich as its restoration approaches completion. The tram originated as a Hurst Nelson semi convertible ( not a single decked cross bench car as commonly recorded), clerestory roofed single decked vehicle; one of 22 such trams purchased in 1901. These bodies would share common equipment with enclosed single deckers, and usage would be seasonal. Only cars 101 to 105 were used in service in this condition, whilst others delivered were never deployed as such. This concept was not successful and the bodies were used as the basis of creating the famous class F tramcars. The semi convertible vehicles had clerestory roofs, and a saloon gangway, offset in the middle, hence lining up with the offset entrances. Seating was 2 and 1 tip over seats (not cross-bench). The sides were solid panelled to the rubbing strakes, and had roller tambour shutters for inclement weather. Evidence of where the roller pivots was found on 102’s pillars next the roofline. The controllers were in the conventional position on short platforms. Each car had its own B13 controllers, resistances and trolley assembly. Brill 27G bogies were acquired to be permanently fitted to these rebuild tramcars. All cars were initially rebuilt during 1903 within the Byker Body Works exactly the same, but thereafter several received variations by further rebuilding, from 1908 to 1920. 102 believed to be the first such rebuild, during its career, never received any major appearance modifications. The basis for the 1903 rebuild utilised the existing underframe, platforms, bulkheads, saloon pillars, existing B13 controllers, resistances, and lower saloon seating. A new roof/upper deck floor replaced the clerestory roof, and a new horizontal quarter light and upper waist rail were spliced into the existing pillars. No addition steel bracing bars were added, except a single 1” round tie rod fitted below the newly fitted upper waist timber rail. Original timbers were teak and added timbers were ash. Full external panelling was teak, backed with glued jute. The controllers were re-positioned to allow the sweep of fitting staircases for the upper deck. New top deck seating was made in the Byker workshops. New 27G trucks were purchased with a 4 25HP motor arrangement. Livery was crimson lake and ivory like all other Newcastle tramcars at this time (unlike the supposed liveries suggested by Beamish on 114). The years of operation in the city for 102 was fairly uneventful, but provided reliable service on the Scotswood to Walker routes (Heavy industry with a huge demand for the carriage of factory and shipyard workers), and routes to Gosforth Park (Mainly leisure traffic demands including serving the racecourse). 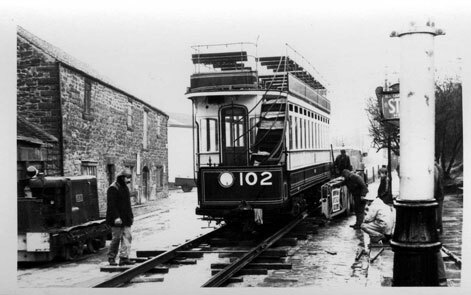 However, 102 was extensively repaired in 1916 following its “runaway” accident in Raby Street, Byker. Repairs involved much work to Number 2 end of the tram involving a new platform, corner posts, cant-rail, and sections of body side structure. Evidence of all this work was apparent during the dismantling of the tram in 1967/68 during the substantial body restoration. The tram returned to service with its 4 motors and only the handbrake braking. In 1933, 102 received its only full overhaul, when the trucks were modified with 2 35HP motors; one in the inbound truck location, with a Westinghouse Air Brake piston assembly fitted in the outboard position; the space where the second motor was fitted originally. During this overhaul, 102 received the Lemon Chrome addition to the livery; this condition, detail and appearance of this overhaul is exactly how the tram was restored, and as displayed at Crich. Up to withdrawal, 102 was never overhauled again, with the exception of a further repaint in 1939, when the addition of higher upper deck decency boards were added, and finally repainted in 1946; both these repaints had reduced Lemon Chrome panel lining. Following an electric fire in 1943, 102 was completely rewired. Newcastle 102 was acquired by the Light Rail Transport League in 1949 and moved from Newcastle Corporation in Forest Road, Longbenton, Newcastle, and later moved to Bury Corporation depot. In 1958, the tram moved to outside storage/display at Beaulieu National Motor Museum, Hampshire. Over the time spent at Beaulieu, the car was not repanelled; but aluminium sheeting was fitted covering original panelling. It also received 1.5 inches of ash felting to the upper deck floor creating great weight and covering all seat fixing points. This was an attempt to make the car waterproof, but little work took place to protect water ingress to the body framing. The vehicle then returned to the ex-Newcastle Corporation Tramway Byker depot in 1967 and was stripped to assess the condition for restoration. All this work was undertaken by a small local group of TMS members. The underframe, and basic roof structure were considered to be sound and remain as evidence of the 1901 and 1903 stages. All timbers forming the body sides and bulkheads were totally infected with “wet rot” and required complete replacement. The solebars were at this stage were free from corrosion so were retained. This on one side was the last evidence of the 1916 Raby Street accident as it was not true and straight. Replacement timbers used new materials including teak, mahogany, ash and pitch pine. New corner posts were machined at Byker in the woodwork shop using North Tyneside electrics 3rd rail collector beams. New upper deck flooring, saloon ceiling timbers, interior panelling, cantrails, and platform timbers were fitted. All traction wiring was fully testing and considered to be more than serviceable. The trucks received attention including reprofiling the wheels to Crich requirements; the trucks had been overhauled upon withdrawal in 1948/1949 for George Hearse including fitting new tyres and overhauled motors. All this work reduced what was required in 1967 to1970, but included overhauling the motors once again. With developments at Byker and the forthcoming forming of the PTE, 102 was required to be moved, and consequently spent a few years at Clay Cross, where the remainder of restoration work was completed. The car was then transferred finally to Crich where commissioning work to operational condition was completed. The electrical and mechanical equipment currently with 102 is mainly as present when the tram passed into preservation. However the BTH B13 controllers, although overhauled and used on the car during its early years operating at Crich (interestingly having a mis-matched pair of controller tops), have since been replaced by B18 units; the current location of these original controllers is unknown whether still at Crich or within Clay Cross. The mis -matched pair of controller covers could have been fitted to the B18 units preserving historical accuracy but did not take place. Original restored circuit breakers were removed at Crich and replaced by conventional units. This change removed an interesting feature of the class F cars. The early pattern circuit breaker was encased in a wooden box. To switch the breaker to “on”, there was a conventional handle but to switch the breaker off, there was a wooden peg with a button on the end passing through the wooden box. This feature is no longer on the car. Currently on display at Crich, some paintwork has taken place since restoration and portrays non-authentic appearance. Inaccuracies have been created currently of the 1933 condition; the lemon chrome side panels now have incorrect lining with 8 Greek keys missing, the staircases should be lined out on the stringers, and the floor painting should be dark grey. The trolley pole and its trolley head is an original class F NCT & EU manufactured trolley wheel assembly. Whilst Newcastle 102 represents the large capacity open topped tramcar, it also portrays what was created by total rebuilding from a mis-guided attempt to create summer saloons for the City of Newcastle. As a footnote Newcastle 102 provided the only means of research to establish the liveries through its life back to 1903 when this tram was rebuilt from a single decked semi convertible Hurst Nelson tram. Through assistance from Coach painters then still employed by Newcastle Transport & E U, all relevant panelling was rubbed down to reveal all previous colour schemes and colours, right back to its original livery. Despite the recent livery applied to Newcastle 114, no evidence was present to verify this scheme analysing 102's fabric. Original livery did not have any lemon chrome at all, and was traditional crimson lake and ivory throughout the tram appearance. Lemon chrome only appeared in the analysis at the 4th repaint as suspected and retold by Coach painters at Byker. This livery formed one of the key decisions to restore Newcastle 102 to its 1933 condition when lemon chrome was first used. Author: John Henderson - September 2013. John was lead team member of the Gateshead 52 group who were involved in the restoration of Newcastle 102.